With apologies to our faithful readers, Wright’s Writing Corner will not post an article this week. The Wright household computer is at the shop being repaired. 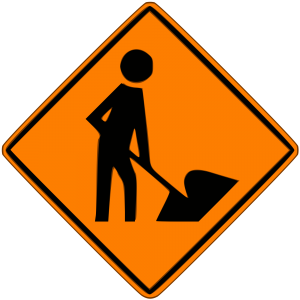 One day, my mother said that construction sign looked like a man feeding a whale. Now I see it too, and I can’t unsee it. It’s a beluga, I think. I hope the problem is easily remedied. Inexpensively, too. And now, I see a man feeding a beluga. That information will be filed in that part of my brain that views bathroom hand dryers as dispensing bacon. Mmm, bacon. I might use them more (instead of getting fed up and drying my hands on my pants) if I knew they dispensed bacon. Hope you are back soon (quick, everyone, we can talk about them now! ).